Hello and happy Wednesday! 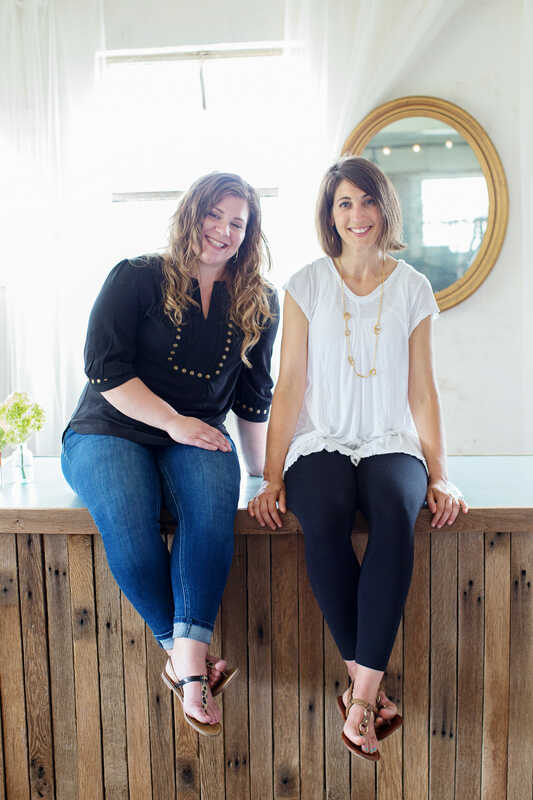 I am so excited to be participating in one of my favorite tours of the year, the Blogger Stylin’ Home Tours hosted by my friend Lindsay of The White Buffalo Styling Co. This time around, Lindsay has invited us to share our work & play spaces. I thought about sharing my porch because typically in Spring it’s my family’s favorite place to hang out, eat dinner, play rounds of Uno, and share our stories. But Winter arrived late and left late, so it wasn’t quite ready. 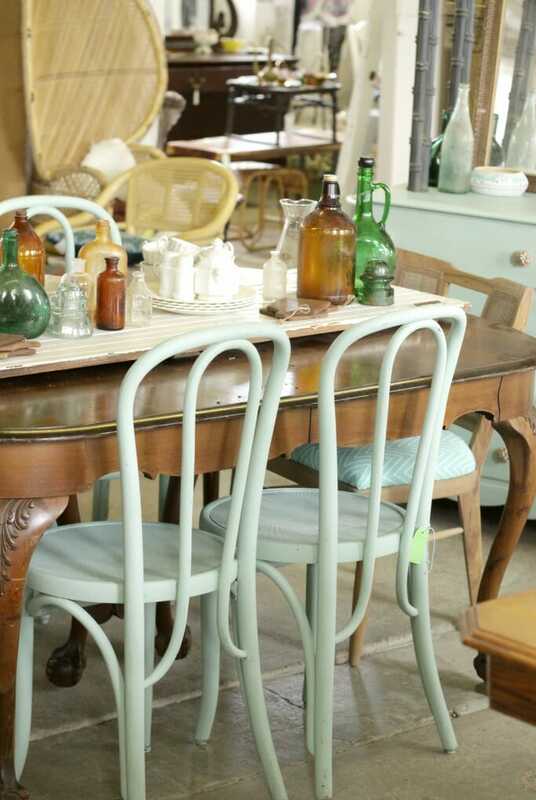 I decided to do something a little different and share my place of work outside the home- my vintage shop, Sweet Clover. If you are here from The Wicker House, welcome! Emily is one of my absolute favorites- I love her casual coastal bohemian style. 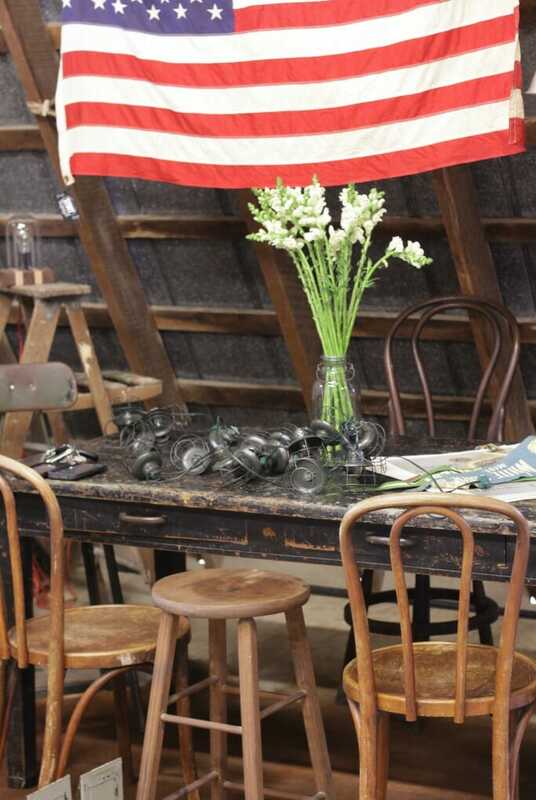 Sweet Clover is not a regular vintage shop… We are a vintage barn sale located in Frederick, Maryland, and we are only open one weekend a month. 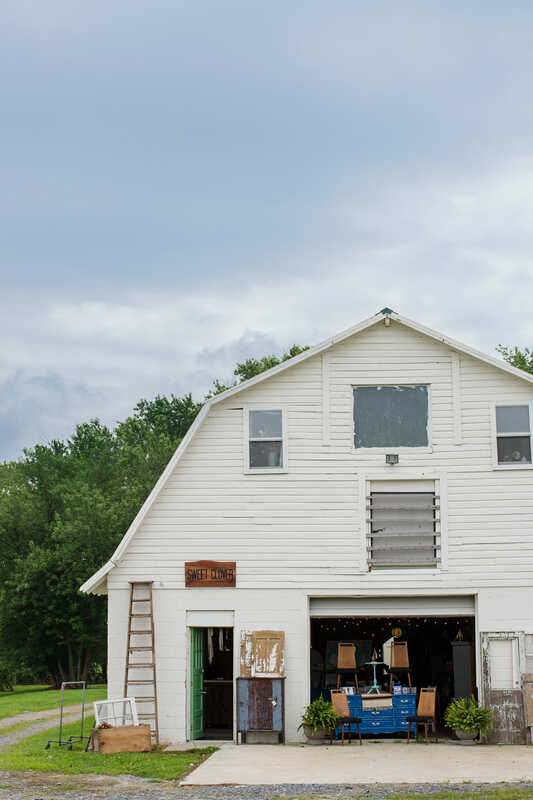 Our location is literally an old dairy barn and because of that it certainly comes with its quirks, but its rustic rural charm is part of the shopping experience. 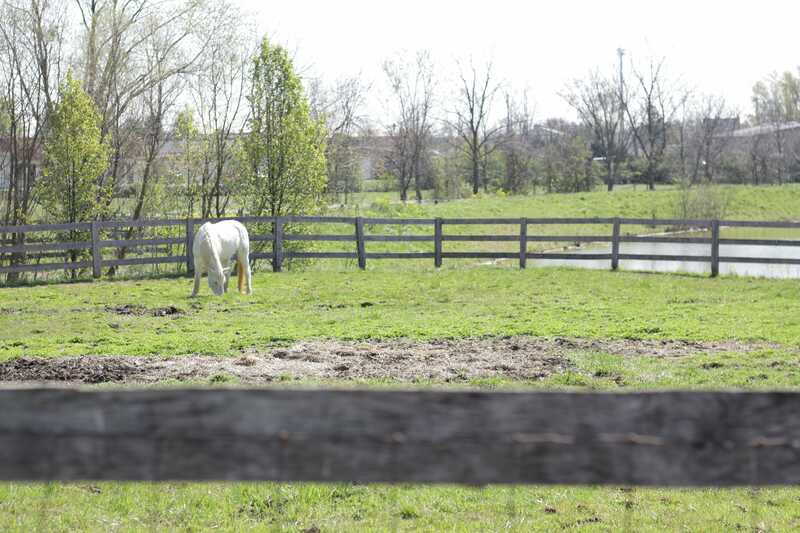 Oh, and I should mention it is located on an actual operating horse farm. Our landlords have over 30 horses and they help create a serene country vibe. I share the business of Sweet Clover with the best partner I could hope for, Sarah. She is a huge part of what makes our place of work also a place of play. We share a weird sense of humor, deep appreciation for sarcasm, and a love of vintage and design. 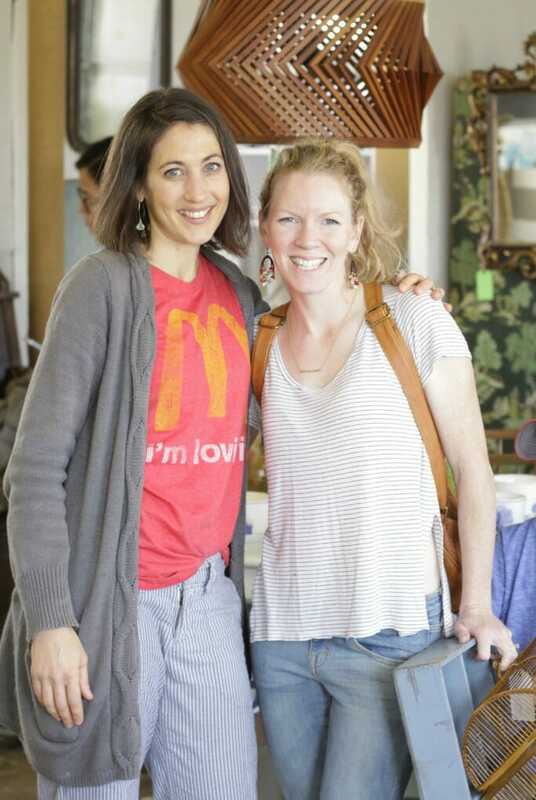 Sarah and I have also spent time finding and cultivating a team of tremendously talented vendors. 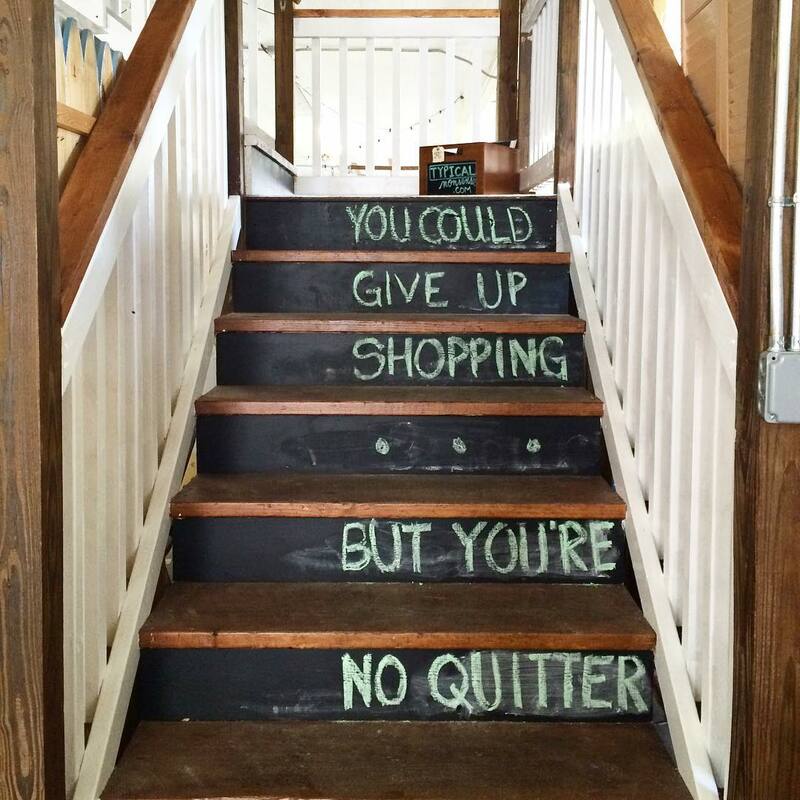 The barn is sectioned into different spaces, and we’ve created a diverse and eclectic shopping experience. 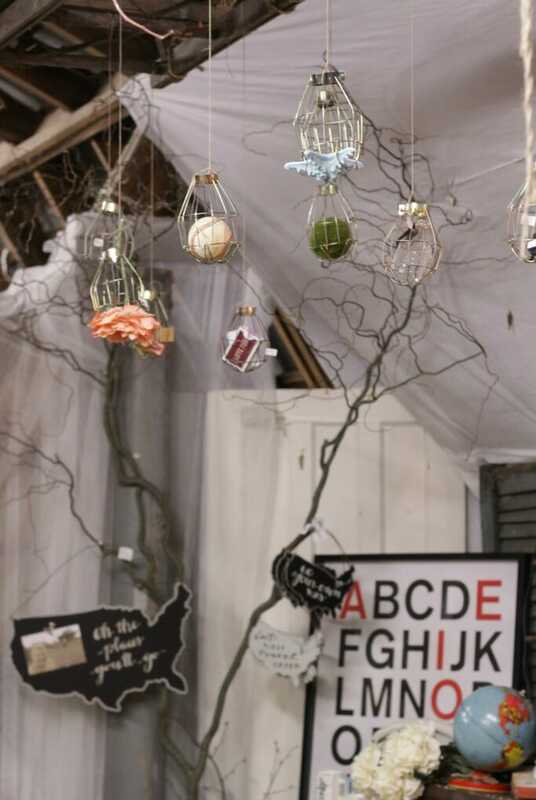 We stage the front of the barn and then each unique space belongs to various vendors. These people inspire me to think outside the box, they find the best vintage, and they stage it beautifully. We just had our April sale this past weekend, so I thought I’d share some of the scenes around the shop before we opened when it was fully stocked and styled, as well as a couple scenes from the weekend itself and the special event we had. 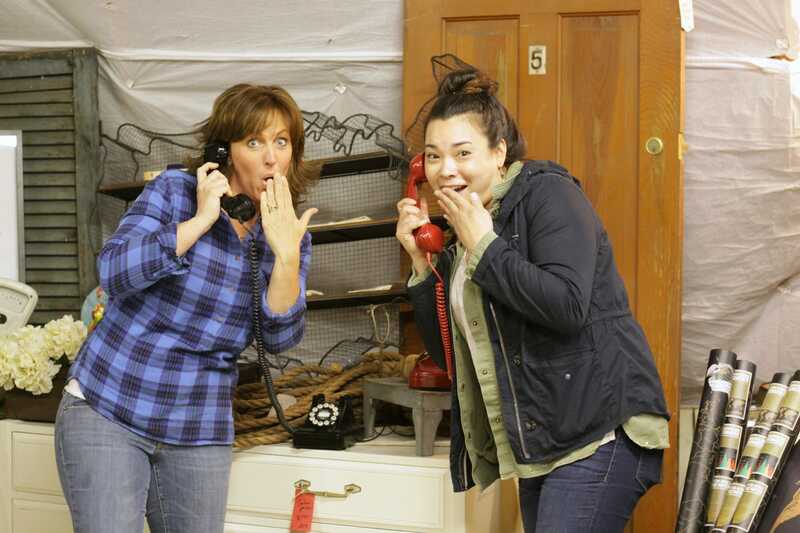 Sarah and I claim the front of the barn as our space to stage and sell our own pieces. We do our best to coordinate before we arrive at work, but often during set up we tend to make it up as we go along. 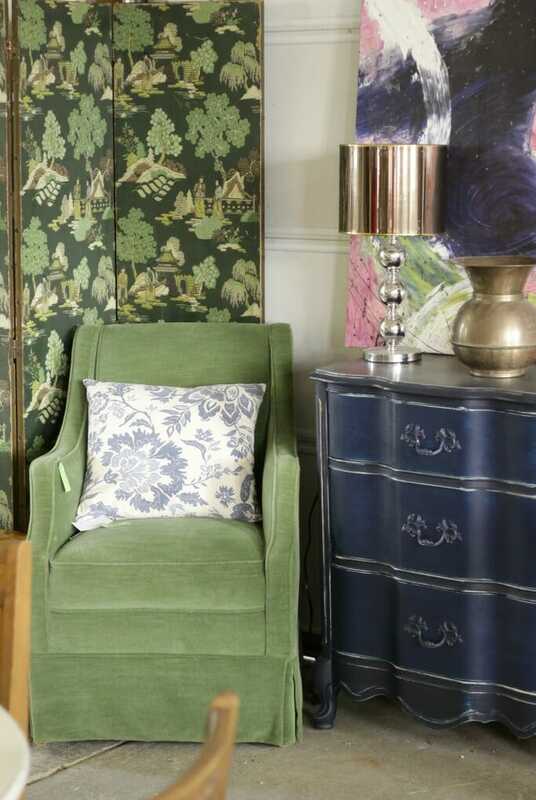 One common theme with us is that we do tend to use a lot of blue and green throughout the year. While we have some vendors that I would say are more midcentury, or French, or British Equestrian, our own space is an eclectic mix of styles. As you can see we carry General Finishes products. In January we opted to move it behind the counter because most people who buy paint either know what they are coming for and can ask as soon as it’s their turn in line, or they have questions about it anyhow! And here is the counter in use Saturday of our sale, with Sarah ringing up a very special guest who you might see later in this tour of work and play spaces. Because we are located in a barn, and it can get very cold or very hot, we don’t keep electronics in the barn, so a large POS was not an option for us. We use tablets, wireless keyboards, wireless printers, Square, a hot spot, as well as another computer system to itemize purchases. It’s a lot to carry down for each sale, but it’s the best method for Sweet Clover. Once you move past the front, the vendor spaces become clear, each vendor boasting their unique style. Because we have so many, I am only going to share a few with you today, but you can visit us on facebook to see our albums for more inspiration. Marlene of the Green Cottage hails from Sweden and her look is always a beautiful Swedish coastal cottage vibe…. needless to say, I love her colors and playfulness. Story Design House is a husband and wife team from Texas. 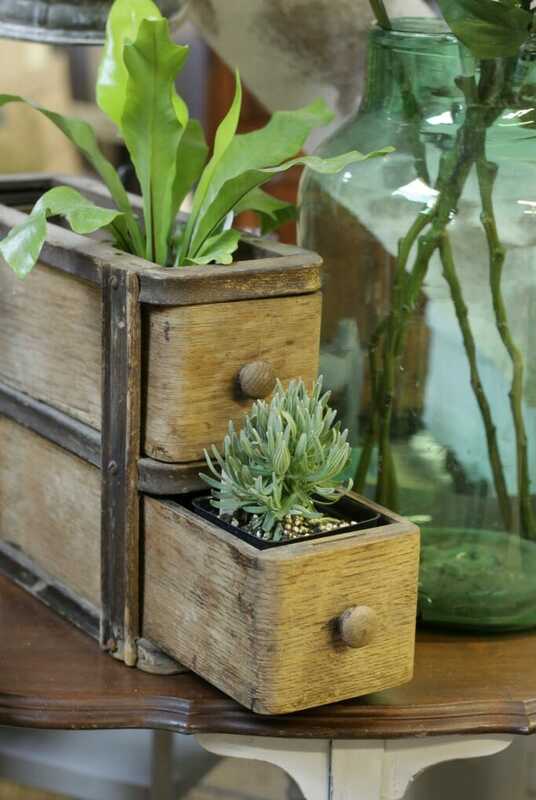 Their rustic Texas roots show through with a blend of industrial American style. This month they brought in a fantastic table from an old printing press, and paired it with bentwoods. I wanted to take this whole situation and transfer it into my dining room. It’s relaxed yet super stylish and chic. And light cages hanging from the ceiling! I wanted to purchase some of these for my porch but I wasn’t sure exactly where I would put them. Open with nothing in them they look like awesome little hanging metal flowers. 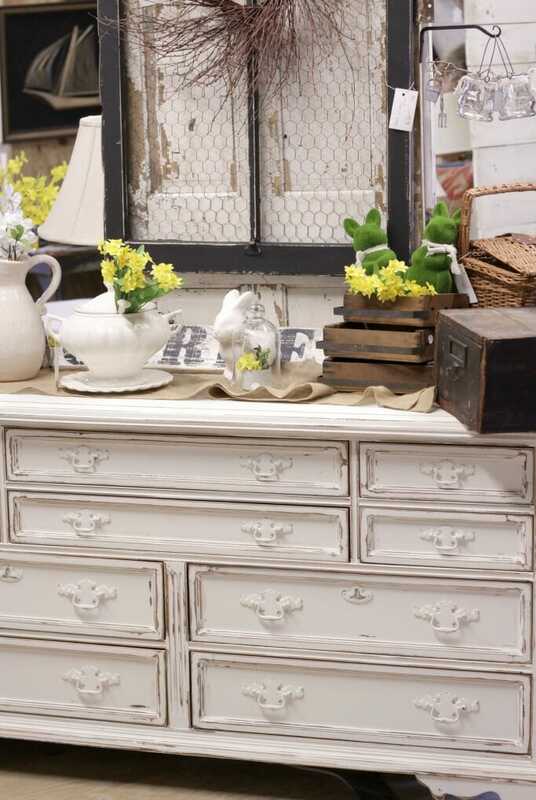 Steph, aka The Shabby Chic Girl, has a beautiful country vibe and her staging is always so warm and cozy, filled with flowers. Aside from being immensely creative, the vendors that are on the Sweet Clover team are a blast to work with! We all are often there the week leading up to our sale, tired and working hard, but keeping each other laughing and smiling. The way that our business operates, we do not have employees, so these vendors are also our “staff” during an open weekend. I can honestly say that I have such a great time when I am at work… typically business is booming, we’re all smiling and laughing, and passing on that warm welcome energy to our customers. At the end of the day when it starts to slow a bit, we tend to have time to just chat and have fun, and get to know one another even better. 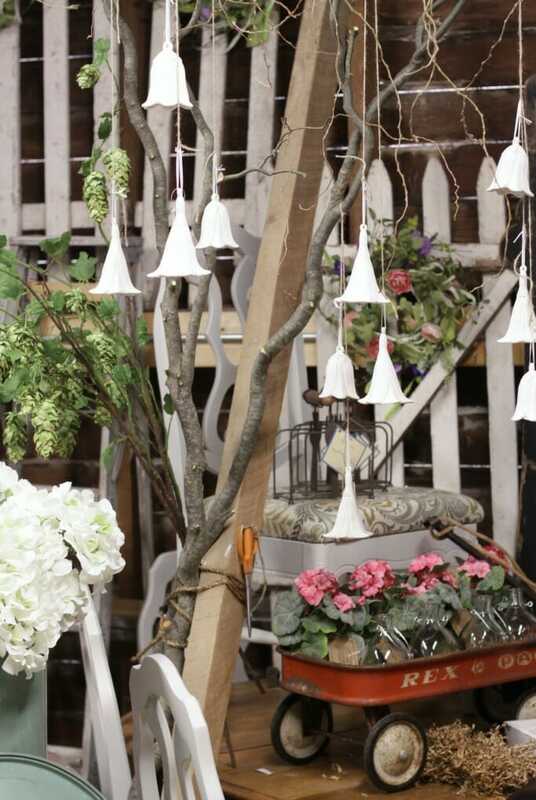 Behind the barn we have a small “milk house” and each month a vendor takes a turn styling it. 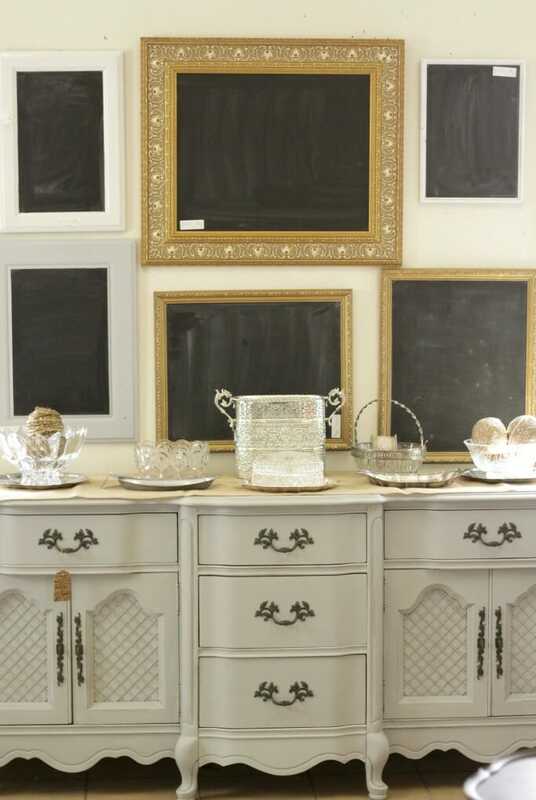 In April Chelsea and Diane of Cloher Collections took it on and this chalkboard and French sideboard vignette was a favorite of mine. Because we are a two story barn, we of course have a stair case, and this past January it received a much needed paint and stain job. We opted for chalkboard paint so that we could vary the message each month. 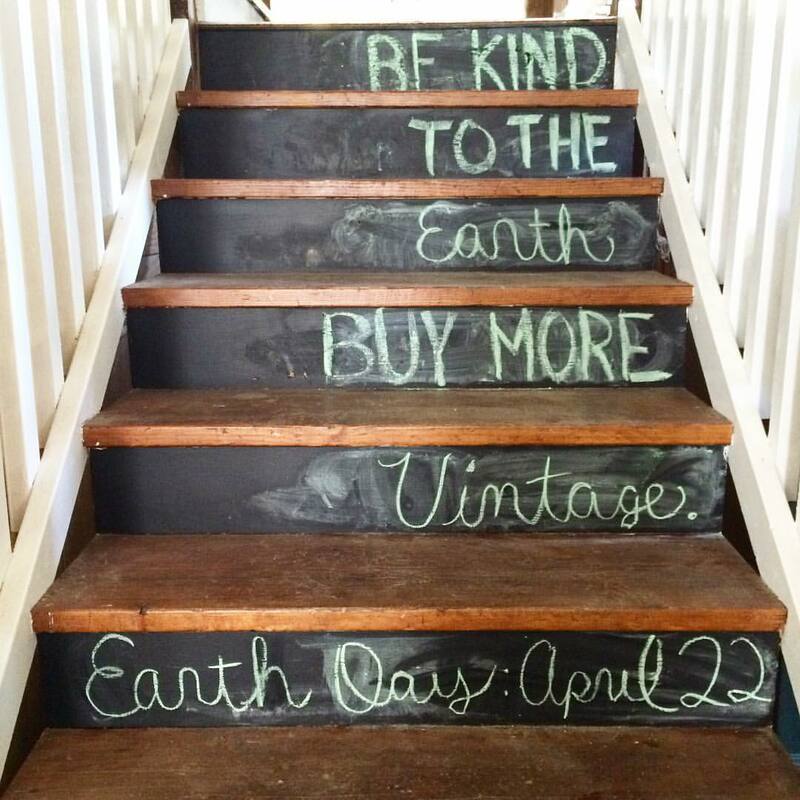 The first month, Kim of Made New by Kimberly Brooke wrote it out in her artsy beautiful chalk hand writing. 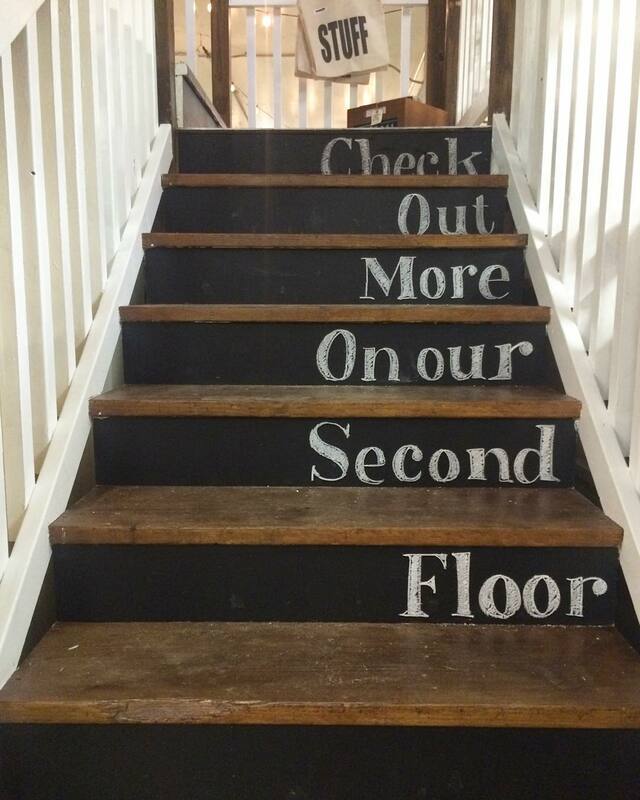 Since then it’s been washed down a couple of times and scuffed up a bit, but we love to add a little personality to our stairs. Last month’s is pictured below, and you can see that I don’t have Kim’s chalk skills! And this month we decided to make a nod towards Earth Day. We have fun coming up with new sayings, and Sarah and I laugh at some of the sarcastic suggestions we make to one another but could never put up on the stairs, like “Open your wallets” or “Buy it all!” So while we will never put that on our stairs, we do like to keep it light and humorous! Sweet Clover supports local entrepreneurs and artists as well, and we love setting up unique collaborative events for our customers. 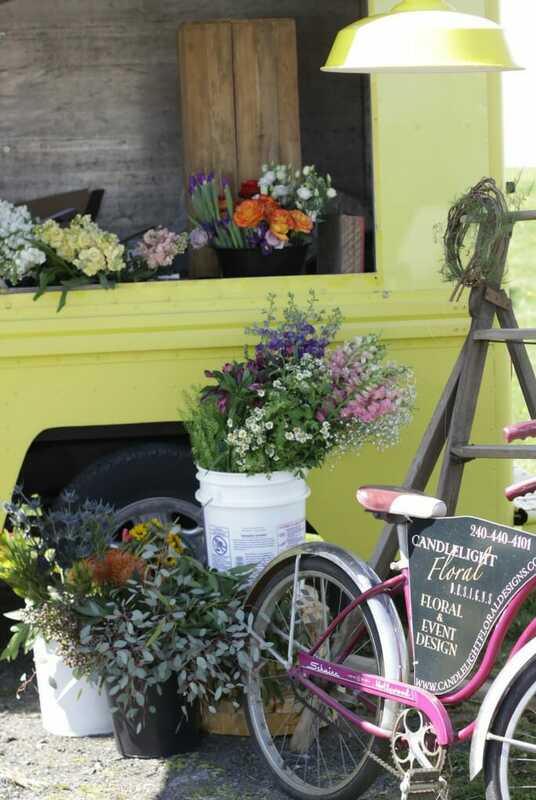 This past weekend we had Candlelight Floral on hand for a mobile bouquet bar they set up just outside. Customers were able to create a bouquet in a vintage vessel of sorts. 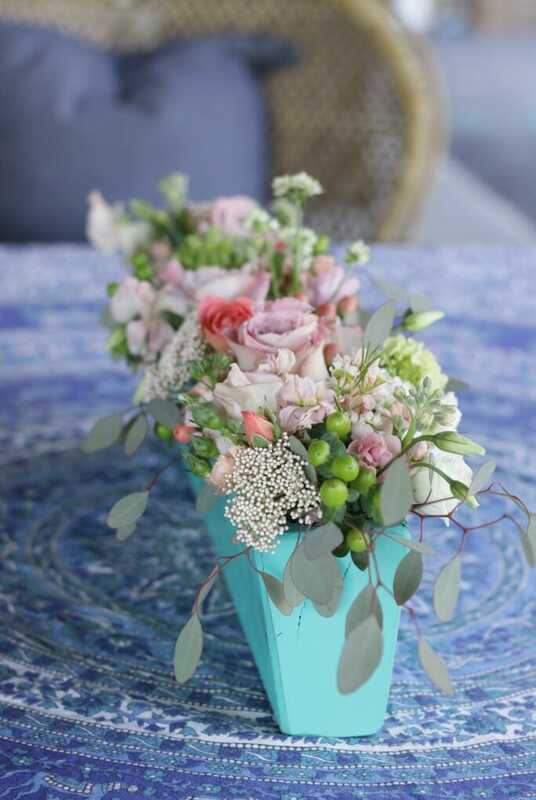 One of our vendors had this centerpiece created for a party she was hosting. 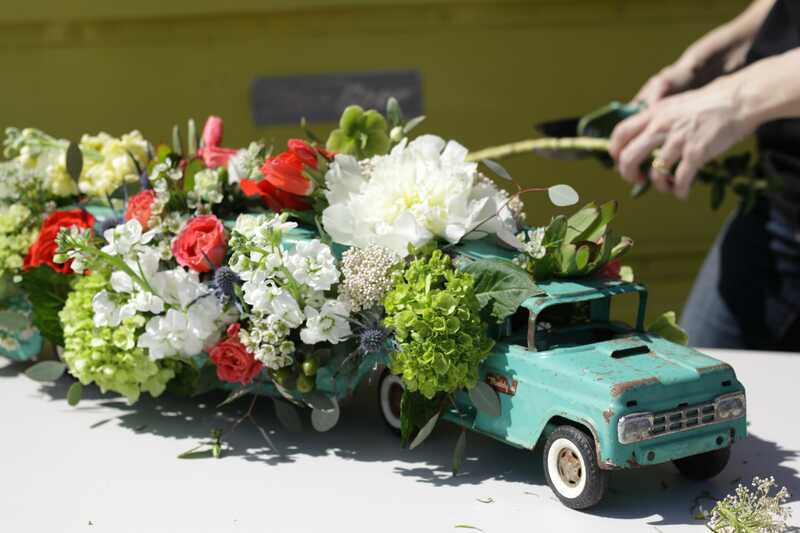 How awesome is a vintage aqua truck filled with flowers? It was just something extra to offer our customers and a fun Spring event. Chelsea of Style Mutt Home (whose backside you saw earlier in this post!) came and had a gorgeous arrangement made in a vintage tin. Check it out on her instagram feed. I did sneak a chance to grab a photo with her before she left, too! It really makes my day when friends come by to see me at work! And admit it, you are lovin’ it. I also took home a beautiful arrangement designed by Candlelight and I had them put it in Emmy’s painted succulent planter. (Because yes, the plants had met their fate… all but one cactus who remained in the arrangement! He’s farther back so you can’t see him below). Coming up in May we have another special event and author and blogger Amy Renea will be with us signing her book, Crafting with Nature. Amy will be staying with me at the Casa Bustamante, and I am thrilled to have her. It’s a beautiful thing to me that my workplace has so many intersections with my blogging work and relationships. I have made many friends through instagram and blogging who have passed through Sweet Clover’s doors, and keep coming back. And that makes me feel like the luckiest girl in the world! One thing I want to also mention is that almost two years ago I shared our Sweet Clover office, which is upstairs in our milk house. It’s sort of messy at the moment, but if you’re interested in seeing where we do much of the business side of things, and store staging materials, check that post out here. Whew! That was a much longer tour than I anticipated, but what can I say? I truly love where I work! It is a place to play creatively, mingle with friends, and run a growing business with an amazing girl boss partner. I love what I do and I love who I do it with. And isn’t the old saying, “If you love what you do you will never work a day in your life?” It’s very true for me at Sweet Clover. Thank you so much for allowing me to share Sweet Clover with you today. Next up, pop over to Beth’s blog, Design Post, for what is sure to be another beautiful tour. Beth’s eclectic Carolina style shows beautifully in her home! And check out the entire line-up below! I so enjoyed seeing more of Sweet Clover!!!! If I’m ever near you I will be popping in for sure. With my U-haul. It is absolutely gorgeous and creativity is dripping off every square inch! that would be so amazing!!!!! thank you, shelley! Sweet Clover is my happy place. i am so glad to hear it! thank you, emy! I love that you shared your store. I want to shop there soooo bad! In every picture I’m like, I want that!…I want that! 🙂 The picture of you and Chelsea is adorable! Looks like such a fun place to be, and oh my gosh, how cute is that barn and the horses….. everything! I wish I liver near so I could come shop! me, too!!!! that would be so amazing! I’ve always wondered more about Sweet Clover, thank you so much for sharing! I love that you’re making your dreams happen with it! It looks like so much fun! I’d LOVE to come to a sale weekend sometime! It is styled so beautifully. I loved taking a look inside! thank you so much- i would love to have you come shop!!! What a hoot! Looks like loads of fun. I love the quirky feel. Thanks for sharing. thank you so much, khadija! Cassie, what a fun tour of Sweet Clover. Though I have to say, being there is WAY funnier! 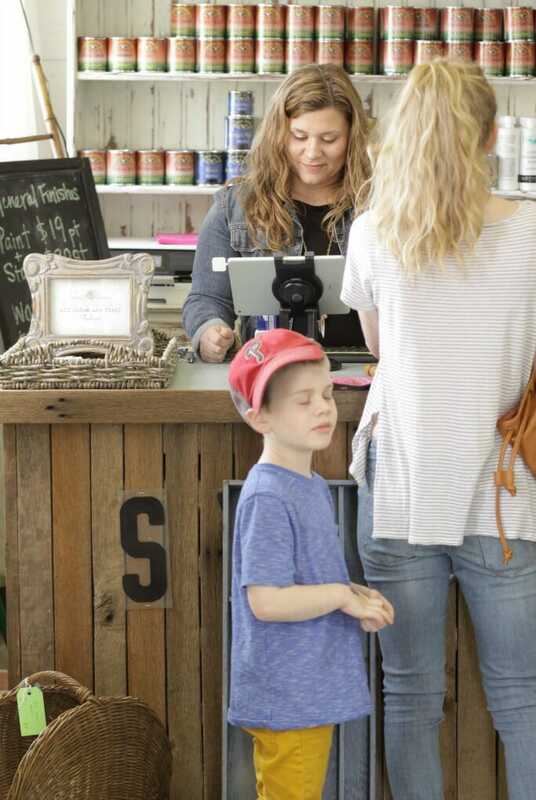 The farm, the styling, all the awesome stuff you always have… Can’t wait to stop by again! thank you so much, cristina! i appreciate that coming from someone who has been! Wish I could pop by every day and hang with you and Sarah! Oh my gosh, I would love to come visit some day! 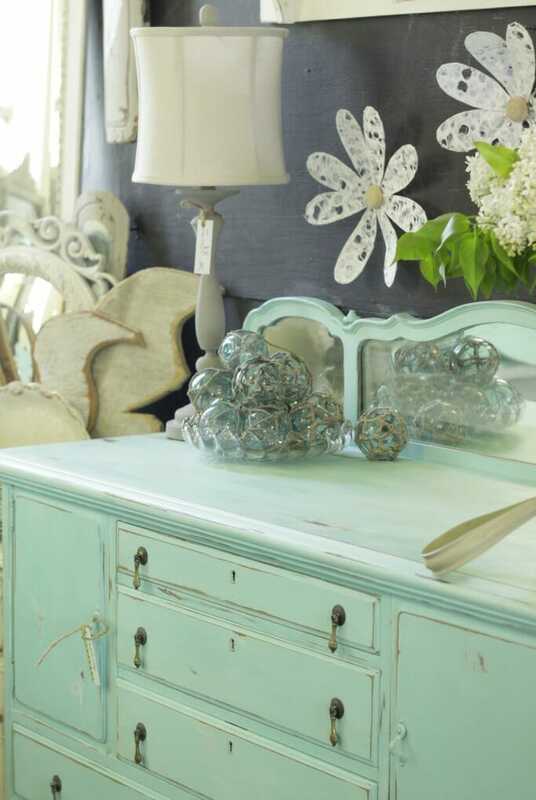 I’m always drawn to your beautiful photos of the shop’s vignettes. I could live there. I HEART YOU 🙂 …and I also think “Open Your Wallets and Let It Rain” might be appropriate for the stairs…maybe I will bring some chalk? I love that you shared something close to your heart! I always “see” you talking about this place and I am so glad to get a glimpse inside! It’s beautiful and I feel like I could spend hours walking around! Love you, friend! So fun to see more of Sweet Clover. It sounds like you love what you’re doing Cassie, and who you’re doing it with! I absolutely loved this Cassie! It’s so clear that you are doing exactly what you were made to do and that’s just the most wonderful and inspiring thing to see! I know it’s not always sunshine and [literal bouquets of] roses, but I’m just so happy you are living out your dream! Love you girl! Keep on being amazing! Oh, what a perfect setup! You’re making me nostalgic for my little antiques shop. And I love that you bring in local businesses to be a part of it all and it becomes a special event to look forward to every month. What a fun group you’ve got there! aaaaw thank you so much! and yes we really do have a fun group! Oh how I wish you and Sweet Clover were nearby! I’d come buy everything! What a fun place to work everyday! thank you so much, shauna! i appreciate it! Cassie, I can’t tell you how much I loved seeing this peek into your work world after hearing about it for so long! I’m dying to come visit this one day. I wish so badly we had one around here….maybe I’ll take a lead from you and open the White Buffalo shop one day! This place is awesome. So happy to have you in BSHT, friend! thank you so much, lindsay- thank you so much for including me as alway. i appreciate it! 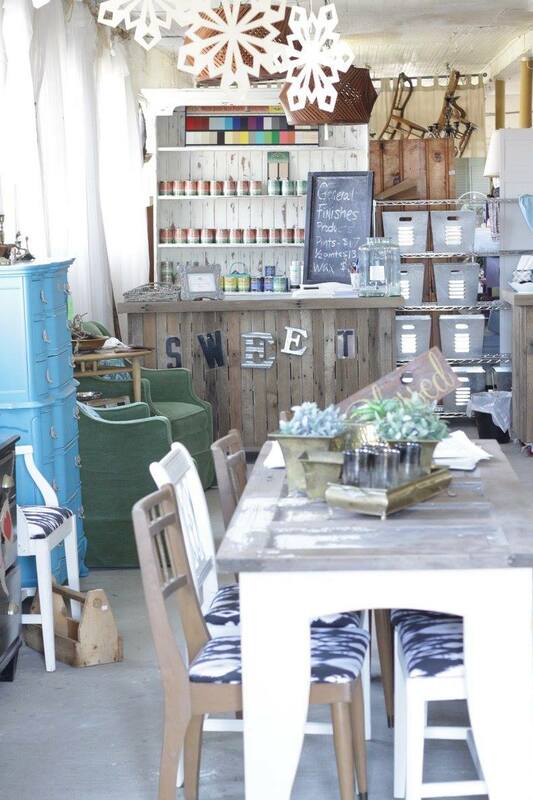 I always love seeing Sweet Clover pictures….it looks like such a fun place! Someday I’ll see it in person! This is SO fun. I’m so glad you shared more of a peek into Sweet Clover. Every single detail is charming and intentional and perfect, in my opinion. I love the checkout area, and that chalkboard wall has my wheels turning. Where you work is BEAUTIFUL!! I want to come visit! It’s absolutely amazing! thank you so much, krystine!